I often have the pleasure of reviewing the Houston Ballet in their Brown Theater home at the Wortham Theater Center. There, it is not surprising to see some dramatic set or staging of their fine productions. But it was a stunning surprise to see the intricate and exquisite scenic design of Peter Farmer that the company transported to the outdoor venue of The Cynthia Woods Mitchell Pavilion for this month’s magnificent production of Giselle. With the soothing and very lovely music of Adolph Adam (Houston Ballet Orchestra elegantly conducted by Ned Battista), the brilliant choreography of Marius Petipa, and the very charming costumes (also designed by Mr. Farmer), this moonlit, forest-scene staging, embraced by lacey trees, had the look of an eye-popping antique painting being presented in 3-D. But allow me to begin at the beginning. George P. Mitchell, the Wortham Foundation, and the Cullen Trust for the Performing Arts sponsored this performance and the available free admission for the audience. This first-class evening of superb dance began with two delightful appetizers prior to the Giselle main course. First up was the “White Swan Pas de Deux” from Tchaikovsky’s Swan Lake. Capturing the splendid grace and whirling romance of this ballet classic (choreographed by Stanton Welch) were dazzling HB stars, Danielle Rowe & Linnar Looris. Starring the lovely and graceful Kelly Myernick and an athletic and bare-chested Jun Shuang Huang, the next offering was the richly romantic “Pas de Deux” from Le Corsaire (The Pirate), featuring choreography styled after the Marius Petipa original, and once again the music of Adolph Adam. Sweetly delicate one moment and acrobatically amazing the next, the stars thrilled the audience with their brilliant dancing. 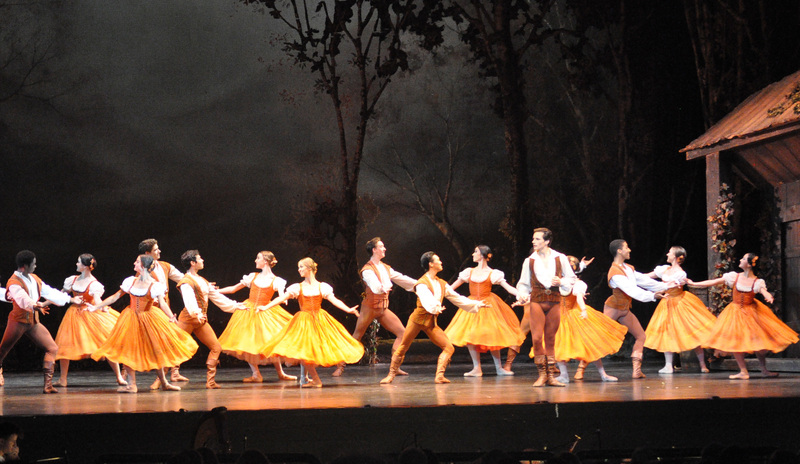 Then it was on to the main event, Giselle, and I think it is safe to say the audience let out a gasp of delight when the curtain first rose on the magnificent peasant village scene embraced by a lovely forest. Five year-old Baylie Jo Clark was seated beside me for her first ballet experience and seemed fully justified in wondering aloud, “Are those real trees?” Even the painted backdrop beautifully enhanced the scene. There would be still more delight as the villagers began to emerge in the soft, autumnal pumpkin colors of Mr. Farmer’s elegant costume designs. Whether portraying aristocrats or peasants, all the dancers were arrayed in colorful splendor. And speaking of splendor, consider the exquisite dancing of Sara Webb in the title role at this performance. The prancing gaiety of her arrival is soon paired with the swashbuckling bravado of handsome Simon Ball in the role of Albrecht, the Duke of Salesia, who courts her while pretending that he is a peasant as well. 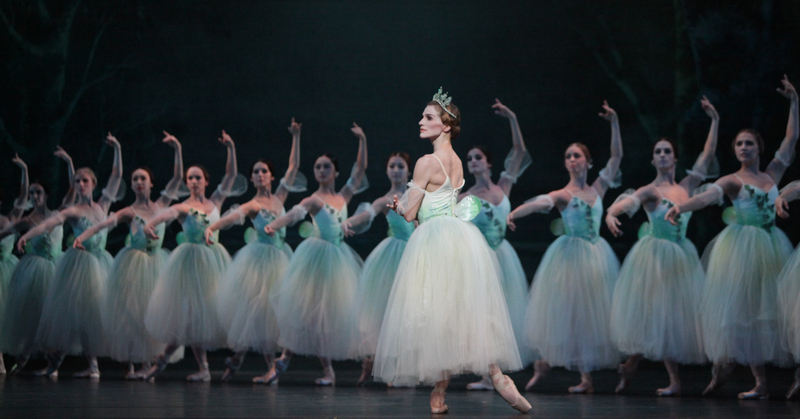 Looking a bit like a matinee idol of the silent film era, Albrect charms Giselle as the two dance divinely. Meanwhile, the gamekeeper, Hilarion (Ian Casady), secretly in love with Giselle himself, lurks nearby, his jealousy growing. Statuesque Samantha Lynch dances the role of Berthe, Giselle’s caring and very protective mother, who tries to rein in the dance exuberance of her frail daughter. As the village peasants gather to join the dancing we are treated to one of the gayest scenes in all ballet. The rich colors of the production are further enhanced with the arrival of a royal hunting party that includes the Prince of Courland (Linnar Looris), his daughter, Bathilde (Jessica Collado), and Christopher Coomer as the Master of the Hunt. Peter Franc plays Wilfried, Albrecht’s squire. The amazed audience interrupted with applause as Webb performed an en pointe “hopping” sequence that was astonishing and finished with a series of captivating 360 degree whirls as Mr. Ball joined her for the dance frenzy of Act One’s tragic ending. Hilarion has revealed that Bathilde is actually Albrecht’s true fiancée, and Giselle dances in despair until she collapses, dying of a broken heart. In Act Two, Berthe’s earlier warning is fulfilled as the spirit of Giselle now takes its place among the Wilis, the vengeful ghosts of young girls who die before marriage. 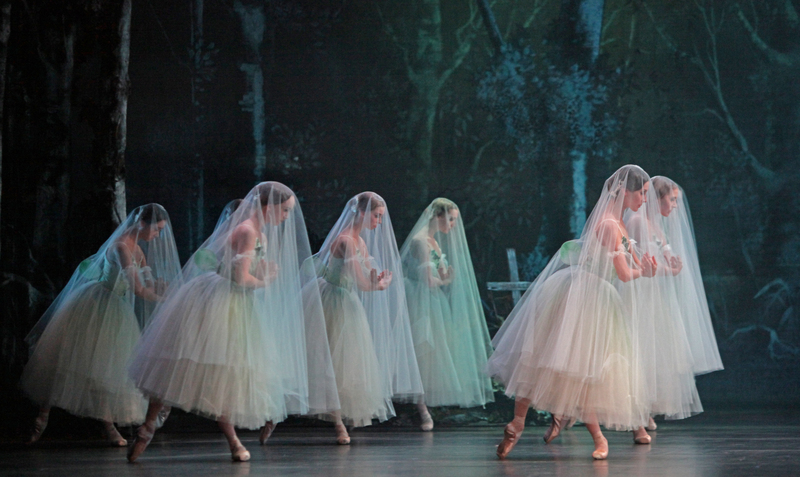 We find ourselves in the dark and misty graveyard of Giselle. The eerie arrival of Myrtha, the mysterious Queen of the Wilis (Melissa Hough in a demanding role) brought more audience applause as she appeared in a ghostly en pointe glide across the stage that was remarkably performed. Remarkable as well was the stunning choreographic synchronization of the large cast of Wilis as danced by the Artists of Houston Ballet with featured dancers, Jessica Collado and Nao Kusuzaki, leading the charge. The delicate and ghostly costumes added to the visual mystery as the lines of dancers interwove with masterful precision while sometimes freezing in dramatic tableaus. With his final dances obscured by stage lighting that was perhaps a bit too dim, Hilarion comes to a tragic end with the dancing advance of the Wilis. Meanwhile, in their ghostly final pas de deux, Mr. Ball seemed to have otherworldly powers of levitation as he lifted Miss Webb heavenward with what gospel singers might call, “Amazing Grace.” Bravo! This entry was posted in Dance Reviews, Miscellaneous Reviews, Theater Reviews, ThePeoplesCritic.com and tagged Ballet, classical, Dance, Entertainment, Houston, Houston Ballet, Reviews. Bookmark the permalink.